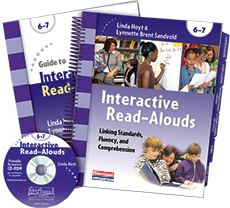 Linda Hoyt's Interactive Read-Alouds will help you make the most of read-aloud time by showing you creative ways to use popular children's literature to teach specific standards and build fluency and comprehension. Combining guided conversations with reflective thinking, Linda's read-aloud lessons engage children in strategic listening, speaking, reading and writing about text. This Heinemann Curricular Resource contains: standards-based lessons designed around children's classics which share the reading strategies and readers theater scripts; a teacher's guide which outlines Linda's thinking behind Interactive Read-Alouds and describes how to apply the strategies in your classroom; and printable resources available on CD-ROM which provide additional resources for your literacy curriculum.